Where did my Course Configuration go? More Configuration items have be relocated to the Admin Username menu as part of our ongoing effort to streamline ampEducator. We have also created a new menu for Administrators under the Username menu called 'Institution Config' and will continue to move the Configuration items over to this section from the original Home > Configuration section. Course Configuration can now be found here for example and is no longer available under Home > Configuration. Any questions please email support@ampeducator.com to start a ticket. 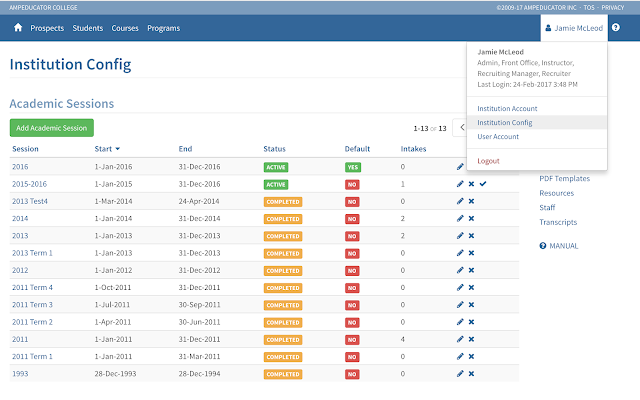 Example: (Admin Users Only) Username > Institution Config menu section.